Fried, creamy, rich and delicious are not typical adjectives a non-vegan would associate with vegan food. However, for more than a year now, the folks at NoDa Bodega have been chipping away at the misconceptions about what vegan food can be by hosting Vegan Night on Thursdays. Judging by the growing popularity of the weekly event, people are starting to get the message. NoDa Bodega, located at 1200 E. 36th Street, made a name for itself offering affordable, unique and downright gourmet pressed sandwiches. 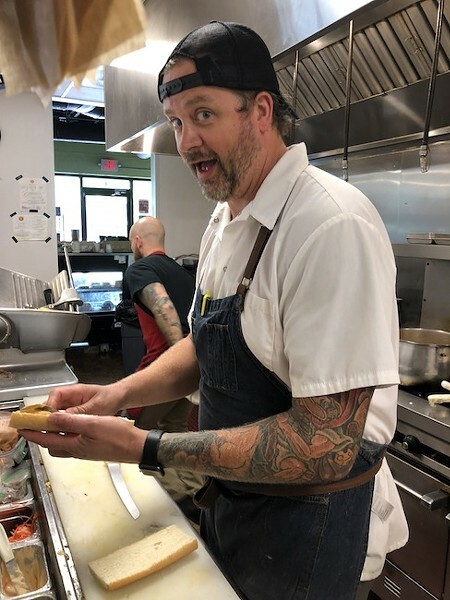 But since January 2017, the deli has been showcasing vegan fare with a changing menu created and executed by chef Bryan Moore, who's been filling up the spot every Thursday with big crowds of food lovers, vegan and non-vegan alike. When husband and wife Bryan and Lisa Moore opened NoDa Bodega at its original location on 35th Street — where Local Loaf is now — Bryan was fulfilling a lifelong dream of opening a sandwich shop. After training at the Culinary Institute of America and working at high-end restaurants in cities like New York, he was ready to join Lisa, a fellow chef with a knack for business, to make his dream a reality. From working with the bare necessities at the restaurant's first location — a hot plate, microwave and soup warmer — the deli gained a following. Now with its new location on 36th Street, the kitchen is slammed at lunchtime with NoDa locals and new customers clamoring for the reuben or to try one of the multiple daily specials. "One of my mentors told me 'If you want to be successful, you open up a restaurant where people want to eat every day,'" Bryan Moore says. Taking that to heart, the Moores offer as many as five or six daily specials at the deli, making it easy for customers to try something new every day. No matter what you try, you can be sure you'll be eating some kind of creative twist on familiar flavors. But even with a big lunchtime following, the Bodega was desolate at dinner. "Our lunches were already established but we needed to try to find a way to justify the bigger space, the bigger rent, the full kitchen, and that's when we started doing nights," Lisa Moore says. On Wednesdays, she created Family Night, during which she serves up family-friendly homestyle meals as well as a Whole 30 diet option. But it was Bryan's introduction of Vegan Night on Thursdays that brought in the big nighttime business. "I used to try to be competitive with him, but he crushed me over and over and over," Lisa says. Around the time Bryan's sister became a vegan, he realized there weren't a lot of options for plant-based dieters. He started to see that providing an alternative to the regular vegan joints could help his business. "This is like a need [that] maybe we could do to get sales up," he says he originally thought. "And then I really got into it, 'cause for me it kinda forces me to get outside of the box." Veganizing food became a fun challenge for the chef. He says that at first the biggest hurdle was adjusting to not focusing a dish around protein, a mindset that was ingrained in him. But now his main concern is consistently coming up with new, delicious recipes. For those who cringe at the thought of a meal with no animal products, NoDa Bodega tricks you into eating a vegan meal without noticing. "You'll like this vegan," Lisa says, confidently. The menus, which are posted on social media at 5 p.m. on Thursdays as Vegan Night starts, have included dishes like Oreo cheesecake, fried mushroom po' boys and a "Carolina dog" — a hot dog made out of a carrot. "When I go into a vegan restaurant I think tofu, tofu, tofu and I'm just not a fan," Lisa says. "But he does a lot of just plant-based where everything's not shoved full of tofu." The July 12 vegan menu featured one of Bryan's personal favorite creations: the fried avocado taco. 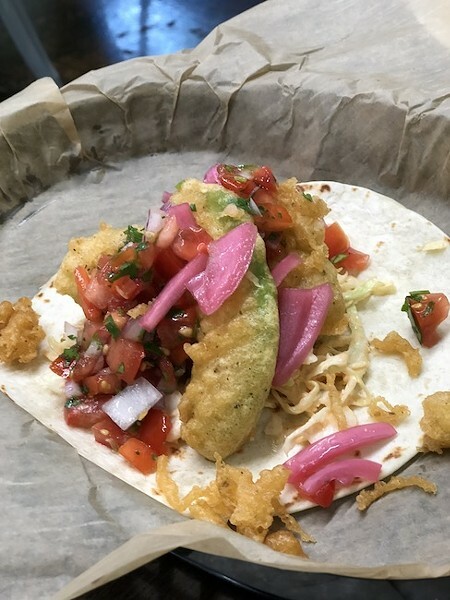 In this dish, a beer-battered and fried hefty avocado slice sits on a bed of chipotle slaw, pico de gallo and pickled red onion, all on a soft flour tortilla. Besides being packed with flavor, the contrast of the crispy fried shell around a warm, gooey avocado slice sends this taco over the edge. 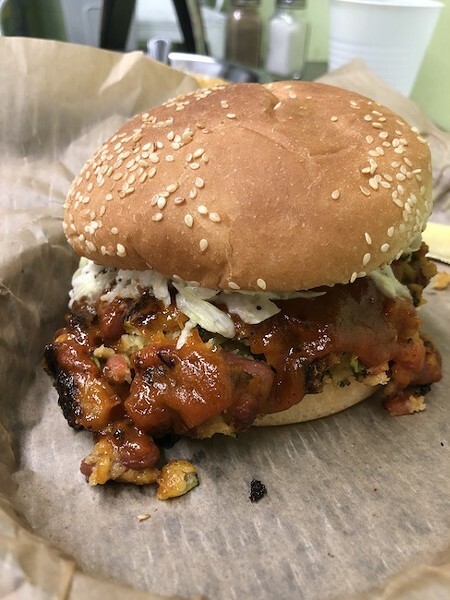 Also served was a BBQ bean burger with a zucchini and kidney bean patty, sorghum barbecue sauce and celery root slaw, which is so creamy it will leave you genuinely confused about the whereabouts of the mayonnaise, on a sesame kaiser roll. 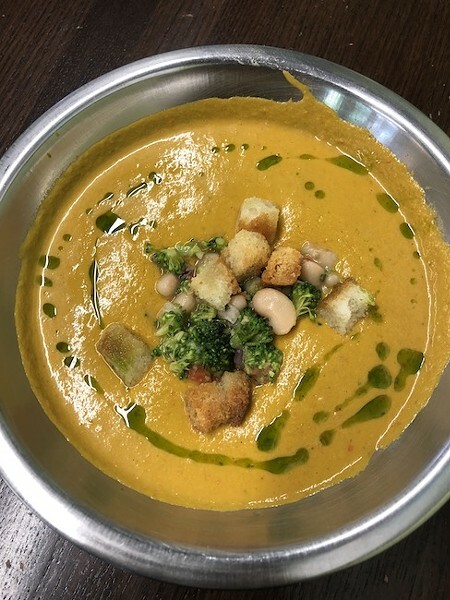 For a more traditionally vegan entree there was the gazpacho with broccoli and white bean salad. The freshness of the dish is pared with a spicy kick that seems to be coming from the croutons, which have melt-in-your-mouth levels of buttery tastiness, minus the butter. And just because you're eating plant-based doesn't mean you can't have your cake and eat it too. The dessert option, a peach cobbler, is reminiscent of what your Southern grandma might whip up at Christmas. Even with vegan butter, the cobbler tastes rich and places an emphasis on sweet, juicy peaches with a perfect pastry. The cobbler is a brand-new recipe, one that the Moores weren't certain would even work. Lisa says she had texted Bryan that he better not publish the vegan night menu until the cobbler was out of the oven and tested. With a small staff and no set of rules to follow, Bryan says there's not a lot of time for recipe testing. But that doesn't stop him from being creative. "I'll see an idea, but then take that and run with it and add things," he says. Experimentation and creative cooking feel at home in NoDa, and Bryan characterizes the Bodega's customers as adventurous. "They're cool," he says. "They're into like, trying different things." The result of adding Vegan Night to the lineup has been wildly successful. At 6:30 on a Thursday you can expect the restaurant to be packed, and that doesn't even reflect the to-go business going on at the counter. Lisa credits Vegan Night and the addition of weekend brunch as the reasons for the recent growth in business. Even with the obvious business Vegan Night has generated, the Moores haven't thought about adding another one to the routine. The two have been incredibly busy balancing the deli with their two children, ages 2 and 4, as is. "We've just kind of been holding on and trying to add and do as much as we can without losing a kid on the way," Lisa says. For the time being, the team plans on keeping up Vegan Night in their little hole-in-the-wall spot in NoDa, hassles be damned. "We're like a neighborhood restaurant. I mean, we don't even have a sign out," Bryan says, laughing. "It's like a mom-and-pop neighborhood restaurant in the strictest sense of the word." The Moores are extremely grateful for their customers and for the community around them. They're also thankful for their impressive 4.5-star Yelp rating. Not only do the owners and chefs at NoDa Bodega know that they have a successful business model, but they are filling a gaping hole Charlotte's food scene in the most yummy and innovative ways possible. That's worth a fifth star.